Due to a time, aggressive focus, and solid management Toyota developed the best methodology for running a business. The advantages today for companies that want to emulate the best practices of the TPS are numerous. There have been books written and presentations galore about what Toyota has done. This almost highlights the disadvantages companies have today to emulate the TPS. TPS is not something you learn about by studying but by living. Toyota operates their company in a unique way that is not easily replicated. Sometimes the only way to internalize a methodology is to go through the process of failure, rework, agony, belief. Let’s go through a brief overview of what you would need to do today to march towards Toyota’s System. Continually improve toward a vision. Some of these commitments are focused on employees, some on the business, and the rest on management. Think of all the problems companies have because they do not put the customer first and the company second. Look at your own company and see if your commitments come close to matching Toyota’s. Without a very close alignment, moving towards the TPS may not be the best strategy. You can never achieve TPS and neither can Toyota. Make your own TPS, it is a constant strive for perfection. Your perfection is different than Toyota’s perfection. Consequently, you start building your own companies Production System. No one can successfully document the TPS because it is ever changing. It is changing to create a competitive advantage for Toyota. Your business must change to create a competitive advantage for you. Toyota assembles supplier parts into an automobile. Unless you have the same business model you should create your own system. Does that “part” give you a competitive advantage? Are you the best at cost controls? Is the total expense of RD&P acceptable? Is it important that competitors not have this capability? Are you concerned about delivery metrics? Is finger pointing a concern? If your supplier has a greater potential to remove costs from the part, it may be time to reconsider your supplier relationship. Toyota outsources about 70% of their parts. Rigorously follow your Guiding Principles and Company Principles. As a result, this creates a culture that brings rich benefits and only comes with time. The TPS is what Toyota has come up with after 60 years of progress. TPS is a methodology for the whole company to live. Fujio Cho, who was the president of Toyota starting in 1999, attempted to write a book describing TPS. This effort failed from the start because TPS is not static (see the last guiding principal). A business cannot just build TPS. Each step towards your own vision of TPS drives quantifiable value into your business. Base your management decisions on a long-term philosophy, even at the expense of short-term financial goals. A great leader marches towards a vision. There will be ups and downs on that road but the vision will come closer to reality. The shareholders may surprise you if you decide to forsake short-term performance for the benefits of long-term gain. Create continuous process flow to bring problems to the surface. Continuous flow is the ideal state. Continuous Improvement is the method needed to march in that direction. Therefore, every company should push to create continuous flow. Use pull systems to avoid overproduction. The first tug in a pull system comes from the customer. This is Build to Order. Build to Order means that you are not overproducing. Level out the workload. Takt Time is the production line heartbeat as a result of customer orders. It is simply the rate of production. As an example let’s say Takt time is one minute. That means a product or service is delivered every minute. That also means that every step in the process completes within a minute. Some processes may only take 30 seconds. The concept of leveling out the workload is to even out the workload so ideally all processes take about a minute. There are some cases where this may not be true. Build a culture of stopping to fix problems, to get quality right the first time.This concept is all about quality and perfection and is based on a culture. It must be okay for anybody to stop an assembly line in order to highlight a quality issue. If this is done smartly, with a strategy, you will be able to stop the process you are working on without immediately shutting down the whole assembly line. Every production line has problems, the goal should be to surface those problems and address them. Standardized tasks are the foundation for continuous improvement and employee empowerment. The goal of a Standardized Task is not to beat up an operator for not following it but to use it as the starting point of a Continuous Improvement program. The Process Operator owns the Standardized Task. The Operator should post it and follow it. It is what is improved in Continuous Improvement. Use visual control so no problems are hidden. Visual Control is simply a way to see if there is a problem. It could be something as simple as an outline of tools on a pegboard all the way to a tray of parts or data that if not completely used signals a problem. Use only reliable, thoroughly tested technology that serves your people and processes. People are your company’s most adaptable tool. Hence verify that technology integrates well into your people system. Grow leaders who thoroughly understand the work, live the philosophy, and teach it to others. Hence, leaders should have a firm understanding of where and what the value the company is adding to the product or service. Leaders should foster teamwork and an environment of Continuous Improvement. Furthermore, leaders should walk the processes that add value. Develop exceptional people and teams who follow your company’s philosophy. Regard employees as part of the company team and make an effort to grow them. This can be through taking classes, teaching classes, presenting to management, etc. In conclusion, your company will grow through the growth of your employees. Respect your extended network of partners and suppliers by challenging them and helping them improve. Partners and Suppliers become more and more important as you become Lean. If you have a pull system then ideally it will connect with a supplier or partners pull system. Therefore Toyota financially invests in their suppliers, with money and employees, to support the supplier’s successful integration with Toyota. Go and see for yourself to thoroughly understand the situation. This has two very important components. First, if a problem is found then those working on the problem need to go and see the problem for themselves. Second, management must periodically walk the processes where the company is adding value for their customers. This is the most important thing a company does and management should be very familiar with it. Make decisions slowly by consensus, thoroughly considering all options; implement decisions rapidly. This is how Toyota operates. Every company has their own decision-making process. It may be time to rethink how decisions are made. Consider this just an example. However, decide slowly and act quickly is a good option. Become a learning organization through relentless reflection and continuous improvement. The most important output of a Continuous Improvement program is the creation of a learning organization. Think about the importance of having a learning organization. Build your own business principles. Remember that Toyota is a Japanese automobile manufacturing company. Their business principles work very well for them yet may not be optimal for other businesses or countries. These principles are certainly a good place to start since we know they work. The finance system which allows them to obtain capital for large projects like a new factory in addition to traditional borrowing. Every business has their list of critical systems, both internal and external, whose efficiency directly benefits the business. Toyota’s strategy is to integrate tightly to every strategic system, whether internal or external. 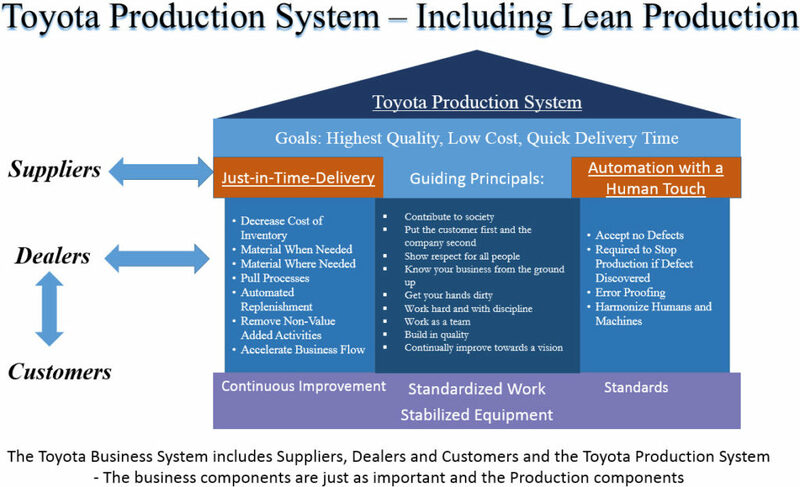 First of all the Toyota Production System is not Lean Six Sigma while it includes Lean Six Sigma. Furthermore, they must be combined together for maximal effectiveness. Therefore if you start a project, make sure that there is knowledge of both. Toyota is the best company. Toyota is more than a Production System but possibly the best run company on earth. US Steel needs to move to the next manufacturing methodology to remain competitive. This shows how you start.